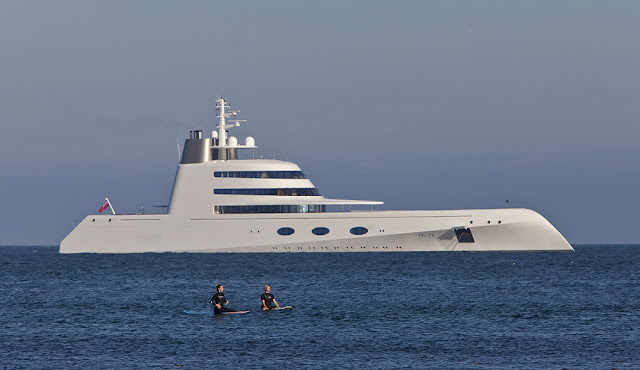 Russian billionaire Andrey Melinchenko's 300 million dollar monster "A" yacht, designed by Phillpe Stark, is anchored off of Malibu's coastline. The "A" has several high tech features, 44 security cameras, a night vision system, a rounded hull that makes entry form the sea very difficult, and a rumored anti-missile system. The futuristic yacht is the main topic of conversation on Malibu's twin pier, with several folks wondering if it is a submarine.